Way back in 1982, at the tender age of 15, I attempted my very first long distance hike and backpacking adventure – The Pennine Way – England’s first designated National Trail. I was inspired by a man who has since become arguably the UK’s premier authority on long distance hiking and backpacking Chris Townsend. In the same year Chris, who had already completed the Pennine way some years earlier in 1976, was undertaking his first overseas long distance walk – The Pacific Crest Trail – and, over 30 years after becoming only one of 11 people to complete this epic journey of over 2,600 miles in 1982, Chris has written a book of his adventure; Rattlesnakes and Bald Eagles – Hiking The Pacific Crest Trail. This is my review of the book. To write a book of events over 30 years after experiencing them is no mean feat – memories fade with each passing year – and I was as much intrigued to see how Chris (also knows as @townsendoutdoor on Twitter) would remember details of his journey after so much time had elapsed as well as of reading an account of what has now become such a well documented trail. What fascinated me most when I heard that Chris was going to write this book was reading about how the Pacific Crest Trail (PCT) was way back in 1982, a time when Ultra Light backpacking was barely an idea and when the PCT attracted people in their hundreds, not the thousands who now regularly make the attempt each year. Indeed the PCT of 1982 was, in many ways, a different trail than it is today some 33 years later and Rattlesnakes and Bald Eagles document some of the changes thanks to Chris’ continued interest in the trail. And it’s this attention to detail that stands out. Chris kept a journal on his journey and refers to it constantly during the book. Every mountain, pass, valley and river is recalled and described in vivid detail and draws the reader into the changing landscape of the PCT – all the way from the trail’s start at the Mexican/American border to the American/Canadian border, a distance of over 2600 miles! Unlike a lot of books about long distance walks that focus on the author’s ‘personal/spiritual/life affirming’ experiences or concentrate on the people met along the way replete with anecdotes Rattlesnakes and Bald Eagles is firmly rooted in the trail itself. Yes there are anecdotes scattered throughout the book and Chris shares with us the experiences of meeting people along the way, but this book is all about the trail; the scenery, the conditions and most of all about the wilderness – something that Chris is most passionate about. Today, in this age of ultra-light hiking gear, it’s hard to imagine carrying over 25 kilos on your back for 2600 plus miles, but Chris carried 50 kilos at times on stretches of the PCT where there were no supply stops for 2 weeks at a time in places. And Chris wasn’t (and isn’t) a big guy. Also the PCT , as I mentioned earlier, was much less travelled and less developed than it is today and these factors, amongst others, makes Chris’ thru-hike all the more remarkable. 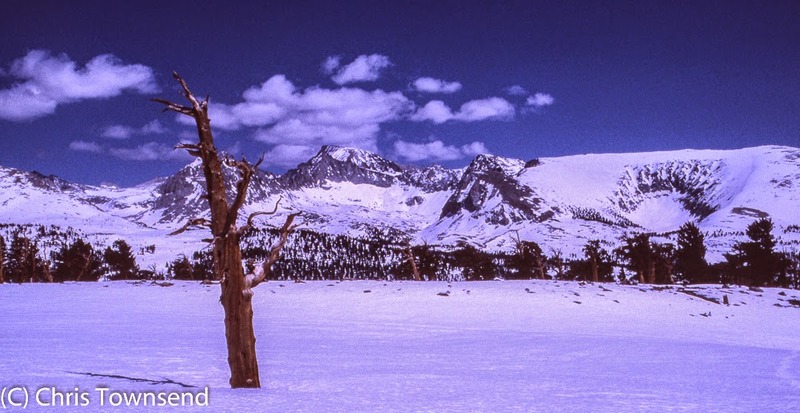 Especially notable is Chris’ traverse of the snowbound High Sierras. 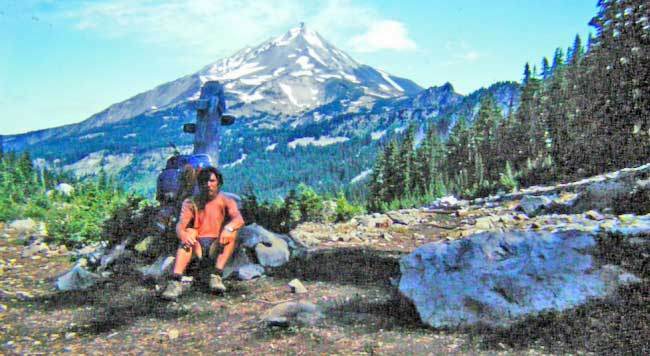 In 1982 only 120 thru-hiker permits were issued for the PCT and only 11 finished, including Chris. One of the main reasons for hikers either dropping out or not thru-hiking the entire trail was the snow in the High Sierras. Although Chris had experienced winter hiking in Scotland before undertaking the Pacific Crest Trail, it makes compelling reading to read of his determination to tackle this section of the trail in extraordinary conditions. In fact, some of the 11 people who completed the PCT did so only by taking a lower level route and missing the High Sierras entirely! 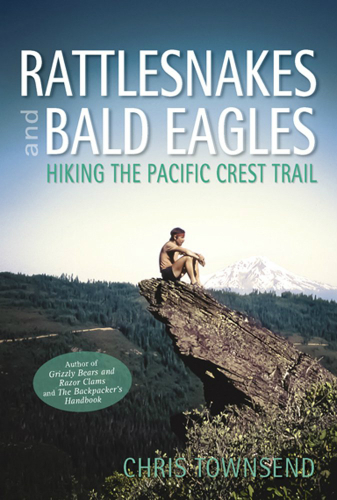 Rattlesnakes and Bald Eagles brings some of the history of the Pacific Crest Trail to the reader’s attention too, not only as a comparison to how the PCT has changed over the past 30 years, but also the trails origins and potential future. Chris’ passion for the trail – or more accurately, his passion for exploring wilderness through long distance walking – shines through this book. As the narrative invites the reader to join Chris on his journey through wild and beautiful scenery, it also details some of the flora and fauna along the PCT too – all of which exciteChris, and his enthusiasm for discovering new trees and birds especially is clearly evident. Unfortunately the Kindle edition of Rattlesnakes and Bald Eagles (which I am reviewing here) doesn’t contain any of the photographs that are available in the hard copy of the book, however the descriptive style of Chris’ writing makes up for their absence. There is a sense of wonder in Chris’ writing that, even after over 30 years since the story of Rattlesnakes and Bald Eagles began, is still movingly evident to the reader. You get the feeling that as Chris wrote this book the memories of his life changing journey brought back emotions and that sense of awe he obviously experienced at the time of his hike. The book is more than simply a recollection of a long ago journey, it is an insight into a a 33 year old man’s growing lifelong passion for the outdoors (Chris celebrated his 33rd birthday during his PCT journey); a passion that hasn’t diminished over 30 years later. But not only does Chris share the majesty and wonder of his journey he also shares those times when his moral was low – after all, thru-hiking over 2600 miles is bound to have less than ideal situations too – and whilst these moments are rare (Chris is ever the optimist) they certainly help balance the book and show that even the most intrepid hiker is subject to loneliness and despair at times. I really enjoyed Rattlesnakes and Bald Eagles: Hiking the Pacific Crest Trail by Chris Townsend and of the 22 hiking related books I read in 2014 it is certainly in my top 3 reads of the year. My only real criticism is that the Kindle edition of the book which I have doesn’t contain any of the photographs found in the hardback version. However, If you are a fan of Chris’ books then Rattlesnakes is certainly required reading and if you’re new to Chris’ writings then this book is certainly a good introduction to this great man’s adventures. Highly recommended! Images and quoted text used with kind permission. Book Reviews, Reviews Book, Chris Townsend, Hiking, Pacific Crest Trail, PCT, Review, townsendoutdoor. permalink. Hiking with the old acorn lady.